It's been a whirlwind week and a half. I paid a long overdue visit to New York where I unfailingly consumed a shocking number of calories in the name of "research" from Grandaisy pizza bianca slices, baked goods from Baked in Red Hook, Momofuku Milk Bar, Levain Bakery, Two Little Red Hens, Jacques Torres, and Bouchon, as well as wholly enjoyable meals at Egg in Williamsburg, J.G. Melon, Barbone, and, of course, Momofuku Ko. I allowed myself to taste every delicious bite set in front of me, and especially ones I sought out, as I attempted to counter their effects with many, many steps on the streets and avenues of the city. 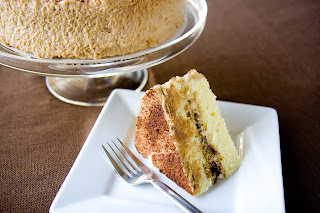 As soon as I returned, it was time to bake as I missed a birthday during the trip with several other birthdays upcoming, as well as this week's Tuesday's With Dorie selection of Tiramisu Cake by Megan of My Baking Adventures. The weekend was full of butter, flour, sugar, and eggs, combining to create banana cake cream cheese frosting, butter yellow cake with bittersweet chocolate frosting, red velvet cake sans food coloring, and then this. The tiramisu cake was definitely the most time consuming of the bunch, but the end result was well worth the effort. 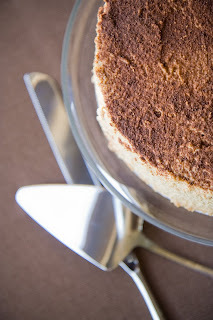 It tastes exactly like tiramisu in cake form, and save for a little dryness in the cake (how does that happen with all that espresso syrup?? ), and the alcohol curdling the frosting (didn't look so good, but boy was the mascarpone frosting tasty! ), it was a wonderful cake. Tweaking will have to be done next time to achieve perfection, but it was a recipe that I may not have tried on my own. 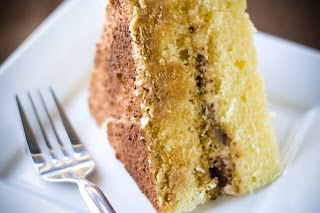 This is the kind of recipe I joined Tuesdays With Dorie for. Love your photos! So glad you enjoyed the cake. I thought it was quite good too! It looks really lovely. I laughed at all the NY stuff...you must have had a GREAT time! uhm... can I order one? for Monday? Baking makes our house too hot. Trade you a burger for a cake? @TonyC My roommates may hate me for turning on the oven so often. You're going to make me a burger? @TeaLady Oh, don't worry. I ate enough for the entire TWD community!